Manchester City may be left with mixed feelings after the agent of Argentine goalkeeper Gerónimo Rulli ruled out a move to Napoli this summer for the 25-year-old. Rulli has been a primary target for the Serie A club this summer and despite no longer being a Man City player, he remains linked to the club by clauses. City have a buy-back option on Rulli that expires next summer, which will give them one last chance to re-sign him, something his father confirmed they failed in an attempt to recently. City are also entitled to 30% of Rulli’s next transfer fee and had Napoli splashed out €20million or more for him in the current transfer window, it would have added at least €6million to the coffers at the Etihad. However, speaking exclusively to TMW, Rulli’s representative Facundo Fraga said, “Napoli is no longer an option for Gerónimo Rulli’s future. Though deprived of some income now, this may not be a bad thing for City, because Rulli could be more open to a move in a year’s time when competing with Ederson won’t impact his chances of playing at the World Cup for Argentina. 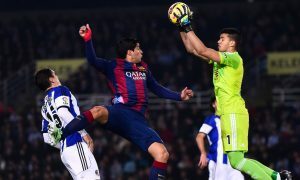 City’s buy-back clause is reportedly fixed at €14 million (£12.1 million), a very reasonable amount for one of La Liga’s best young goalkeepers, and should Claudio Bravo be moved on next summer, he could be an ideal option to come in to challenge Ederson for the gloves.